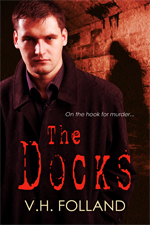 The Docks is a crime novella, set in Britain. Published as an ebook in multiple formats including Kindle, PDF and Nook, The Docks is the first is a series of crime novellas by VH Folland. It is available for $0.99, or the equivalent. As well as the stores mentioned below it is available from Apple, Sony, Kobo and others.